The full moon on 3 February 2015 falls in the middle Leo decan 2, at 15 degrees Leo. There are aspects galore to this full moon, making it very powerful and intense. Leo will obviously feel the full force of the February 2015 full moon. However, the scattering of planets at 15 degrees of other signs means that Aries, Libra, Sagittarius, Capricorn, Aquarius and Pisces also have planets in their decan which are directly impacted by the full moon. 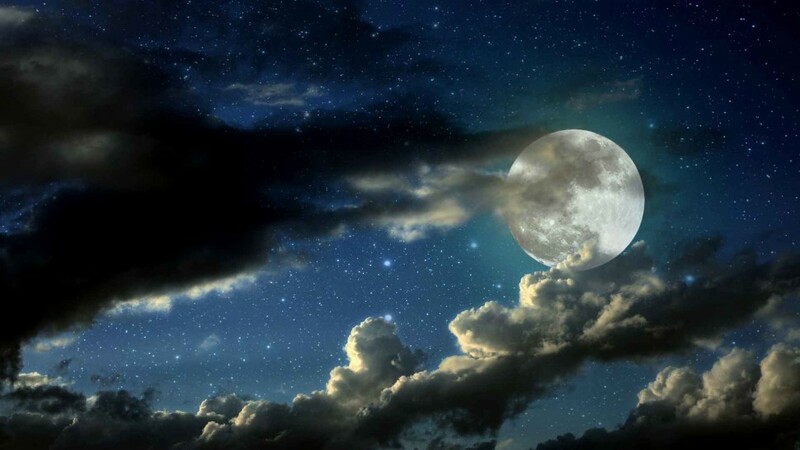 Like all full moons, the influence of this moon phase will last for two weeks, up until the February 18 new moon. Because of the many planets and aspect patterns involves, there are many themes of importance and many areas of life to be affected. As the moon rules the public, women, emotions and instinctive reactions, the major theme will be reacting or rebelling to release a buildup of anger and frustration. Much of this anger will be due to how we see governments, corporations and religions negatively impacting on our lives and our health. You will notice in the chart below a table of aspects on the left. If you follow down under the crescent moon symbol, you will find no less than eight aspects to other planets. Most of these aspects have an orb of around one degree, one reason for the intensity of this full moon. Before I get to the planetary aspects, there is a fixed star influence worth mentioning. The most important star close to the moon is the brightest star in the Crab, constellation Cancer. The fixed star Acubens has a victim feel to it, and has been called the sheltering or hiding place. It makes sense then, given so much intense energy focused on this moon from other planets, amplified by the conjunction to Jupiter, and condensed by the nature of the aspect patterns involved. Feelings of helplessness and suffering, exaggerated by Moon conjunct Jupiter. Next I will look at the most difficult of aspects involved in the Yod aspect pattern. This represent the cause of the apparent victimization by controlling international forces. The I will look to the grand trine to see how the buildup of frustration and anger can be safely released, expressing the publics concerns about the impact of global change on the majority of humanity, the 99% non-elite. 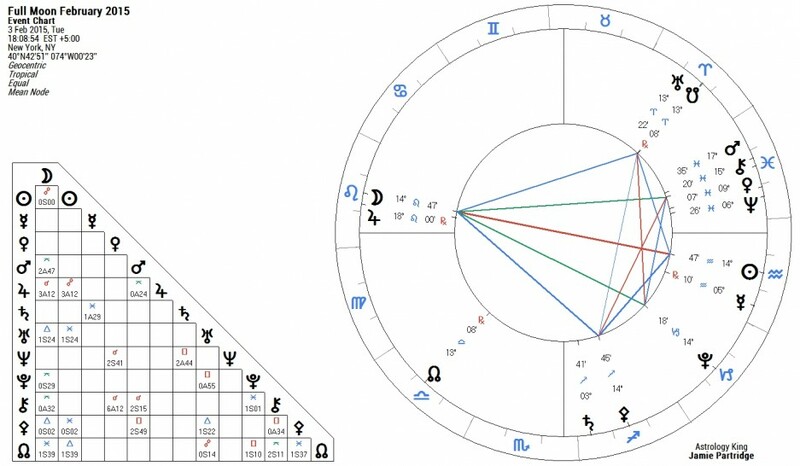 The yod aspect pattern is shown by the green lines to Chiron and Pluto, Mars is also within a three degree orb so will have some influence. Pluto represents the global corporations and union of states like the UN, WHO and NATO. These are being rocked to the core, facing great uncertainty and mass revolts from Uranus square Pluto. Chiron represents the wounds caused by war, global warming, and contamination of the food chain through fertilizers, insecticides and radiation, even genetic engineering. It is worth noting here that the fixed star Acubens has an association with poison and the detrimental effects of refined sugars on the kidneys. The combination of Pluto forces with Chiron wounding and victimization, channels down on the Moon to be felt emotionally. The instinctive reaction is to hide in a sheltering place, or store guns and ammo if you life in the USA. A Yod promotes intense reactions, difficult to control. The stress becomes so much that is nothing is done, the energy explodes with sometimes dramatic consequences. With a boomerang yod as we have here, this neurotic energy bounces across to the reaction point where the Sun is. The Sun represent confident self-expression, personal power and influence. This allows for a more positive reaction facilitated by the grand trine involving Uranus and Pallas. Uranus represents the urge to rebel, to spread the word and reveal a new way of doing things. Asteroid Pallas is a warrior but not like the brute force of Mars. Pallas Athena brings wisdom and creative intelligence. Pattern recognition helps join the dots of the show the corruption of the state by church and corporations. Strategic thinking and the nature of the grand trine make the rebellion not so distasteful or scary. Uranus also represent new technology as in our Internet. This is an integral part of the mass conscious movement toward openness and the forcing change at the top. It is a tool for communities to have greater influence over outcomes, even at the global level. The south node of the Moon on Uranus allows for the best of old style socializing and community to be reinvented to help solve the challenges we face. The April 2015 lunar eclipse at this degree will continue to make this a major theme this year. I’ve had long, thick hair all my life and I just had it all cut short today ! I feel great. I’m totally liberated from my past (and the male gaze)…..So much better, so much more “me”. What a full moon! Yes, and old book on fixed stars which is channeled material: The Fixedx Stars Health and Behavior Inbalances, Ted George and Barabara Parker, I think everything is related. Thanks for the comment Carachi.